Hawaii’s South Kohala Coast enjoys more hours of sunshine and less rainfall than the rest of the Big Island, creating the perfect weather for year-round golf and beautiful greens. Abundant residential resort communities make for a sunny and relaxed resort lifestyle. Residents of the many private, gated resort communities have plenty of golf course options, including a mix of high-end resort experiences and more affordable, public courses. 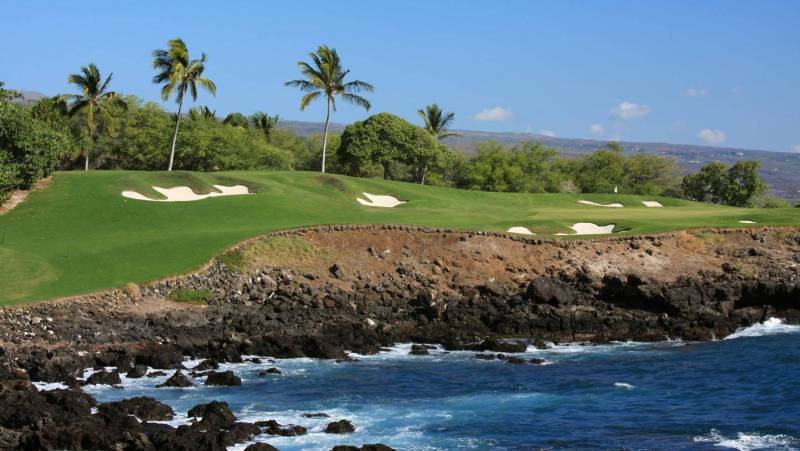 Homebuyers looking to live within minutes of some of the best courses in the state should look no further than the Kohala Coast. Many resort communities, like Ke Kailani located within the Mauna Lani Resort, feature homes with golf course frontage along some of the most beautiful fairways that dot this golfer’s haven. Here we’ve put together a short list of some of our favorite courses on the Big Island’s Kohala Coast. 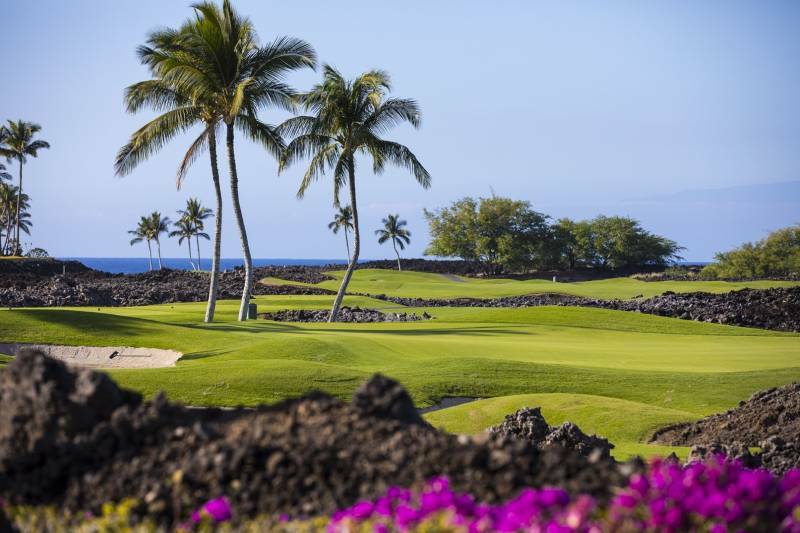 The Mauna Lani Resort is home to two championship golf courses, North and South, both of which offer oceanfront location and black lava-lined holes set against a panoramic backdrop of mountain and ocean views. It was recognized by 2018 Golf Week Magazine as one of the best courses to play and it’s one of the most photographed over-the-ocean golf course holes in the world. The resort also features a Wikiwiki (or quick) Course – a 9-hole walking course for the entire family to enjoy golf together. The Mauna Lani Resort is home to one of the most photographed over-the-ocean golf course holes in the world. This course lives up to its promise – Hawaii Island golf doesn’t get any better! The Kings’ Course is a traditional Scottish design complemented by dramatic contrasts of lava fields, green fairways, and the Pacific Ocean. It’s referred to as a “player’s course” with four sets of tees for golfers to choose from and multiple “drive-able” holes. 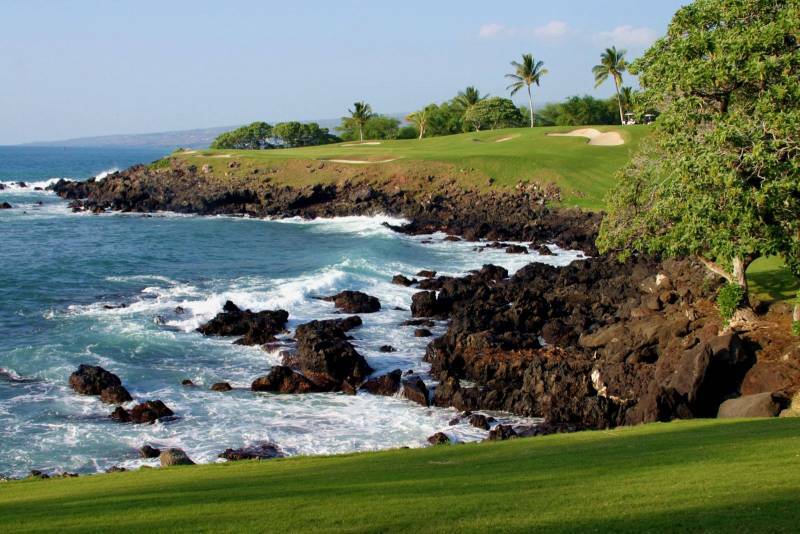 The second oldest golf course on the Big Island, Waikoloa Village is a local favorite with stunning views of the Kohala Coast as well as five volcanoes: Kohala, Mauna Kea, Mauna Loa, Hualalai, and Maui’s Haleakala. Waikoloa Village is based at 1,000 feet of elevation and is an excellent mid-priced option. Kohala Coast residential resort communities have plenty of golfing options, including a mix of high-end resort experiences and public courses. A pair of award-winning, championship golf courses, Mauna Kea and Hapuna, are situated on a black lava field with stunning lush fairways, seaside cliffs and ocean views across a backdrop of the snow-capped Mauna Kea volcano. Be prepared for gusty winds by practicing low shots and be sure to rent a GolfBoard, an innovative and fun way to ride through the course in record time. 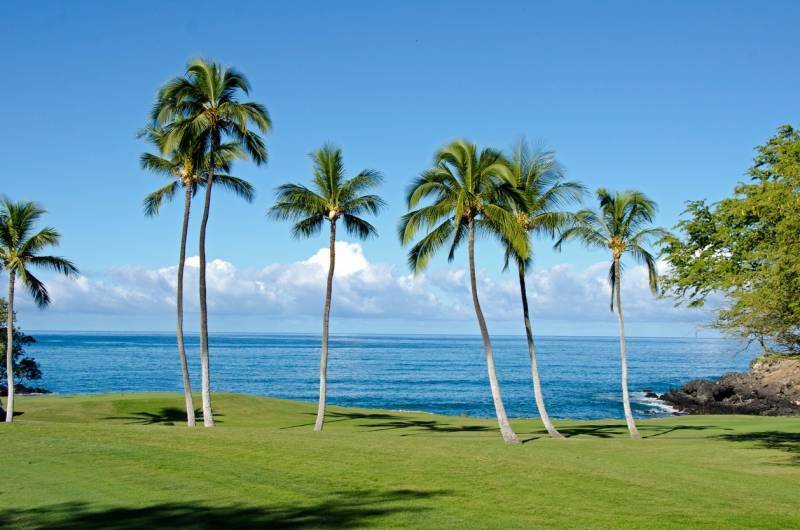 An oceanfront golf fairway with swaying palms and blue skies at the Mauna Kea Resort course.